I have seen some beautiful bread braids on different blogs. Some that are savory and then some that are sweet. I always thought they looked complicated, a little too complicated to make. But I had some apples that I wanted to use up and I wanted to make a coffee cake. I was looking around on the web for a recipe that was something a little different. 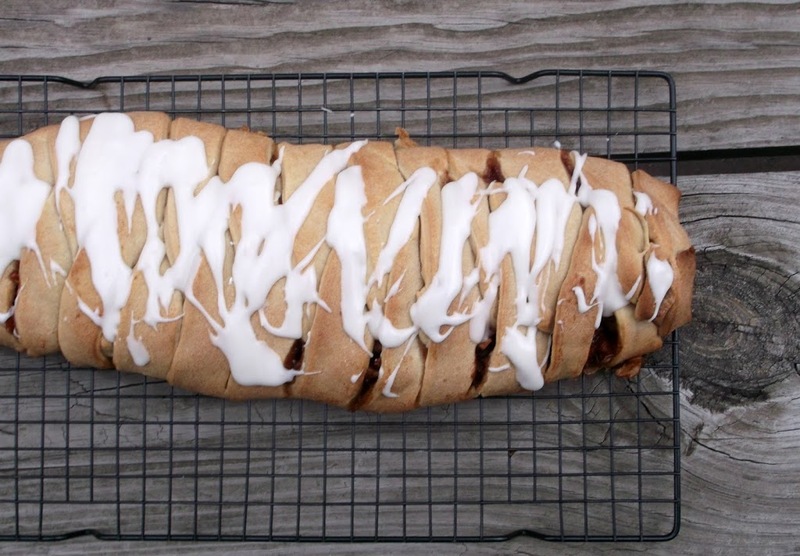 That is when I saw this apple coffee cake braid on the Taste of Home site. It looked so good, that I knew that it was time to give a bread braid a chance. If you follow my blog at all you will know that I am a big fan of homemade bread. So I like the fact that this recipe for the braid has a nice recipe for the bread part of it. The bread turns out soft, sweet, and buttery… so yummy. 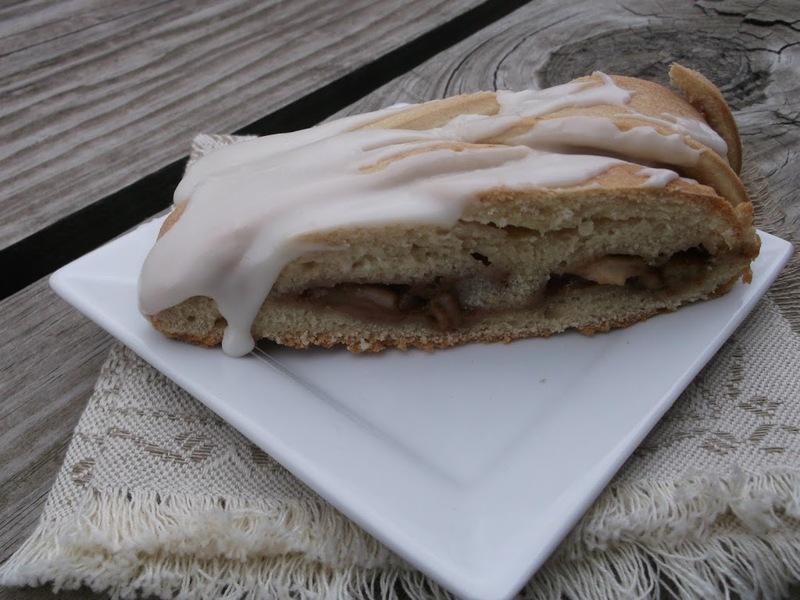 The filling is a simple apple filling with brown sugar and cinnamon. After it is done baking it is topped off with a simple glaze. And let me tell you when it is baking the aroma of apples and cinnamon takes over your house. I love the smell of apples and cinnamon baking in the fall, don’t you? And as for the assembling of this braid, it wasn’t as scary as I thought it would be. My only thing I would have changed for the assembly is that when I was cutting the strips for the braid I would not have cut quite as close to the filling. Some of the juice from the filling leaked out a little, but that didn’t change the taste of the braid. But overall this was easy to make and turns out delicious and elegant. It is perfect for a special breakfast or brunch. * In a large bowl add the water and yeast stir until the yeast is dissolved and then add the sugar and mix that in well. Add the softened butter, egg, 1 cup of flour, and salt and mix in. Gradually add the remaining flour mixing in by hand. Knead until the you have a soft dough. Grease the bottom of the bowl and turn the bread to coat both sides. (The recipe called for a bread machine, if you prefer this method please follow these steps – In a bread machine pan, place the first seven ingredients in order suggested by the manufacturer. Select dough setting (check dough after 5 minutes of mixing; add 1 to 2 tablespoons of water or flour, if needed). I let the dough rise in a warm place until about double which should take about 45 minutes to an hour. * For filling, in a large bowl, combine the apples, brown sugar, flour, and cinnamon; set aside. When the dough is ready turn the dough onto a lightly greased baking sheet. Roll or pat into a 15 inch x 10 rectangle; spread butter down the center thirds of rectangle. Spoon filling over butter. * On each long side, cut 1 inch wide strips to within 1 inch of filling. Starting at one end, fold alternating strips at an angle across filling; seal ends. Cover and let rise until doubled, about 30 to 40 minutes. * Bake at 350 degrees for 30 to 35 minutes or until golden brown. Cool on a wire rack. 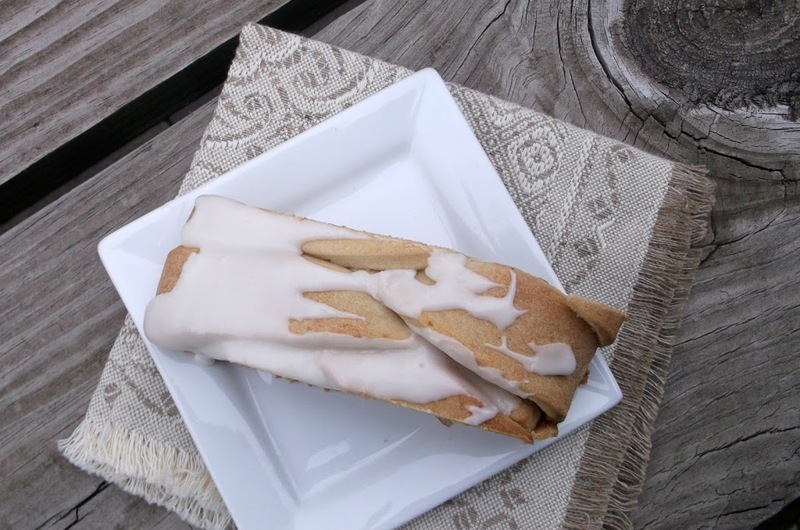 Combine the confectioners’ sugar, vanilla and enough milk to achieve desired consistency; drizzle over coffee cake. I love making braids. This one looks delicious! Your braid came out really good! And this looks and sounds absolutely delicious! I love coffee cakes like this.